When you are working for someone else, you probably don’t want them to know you have set up your own business, so you will be given some tips on how to keep it secret. This book will help you develop a business idea and then how to figure out if there is a market for the product or service you have selected. Learn about legal structures for your part-time business and government sales tax permits. Since computers can make the running of your part-time business so much more efficient, get some tips on how to select the most suitable computer. Then take a tour of software that will help you run your business efficiently, including a review of inexpensive accounting packages. Learn how to create your own Web site and what’s involved in opening your own Web store. Another smart alternative is to sell merchandise at eBay auctions or by opening your own eBay store. Find out how to do this! Direct mail marketing can be an effective way of selling your products or services and this book will show you what’s involved. It will also review some other advertising and marketing methods which are suitable for you, as a part-time business owner. This book provides you with all the basic pointers you’ll need to get started to set up your own successful part-time business. Chapter 3 - Is There a Market for Your Product or Service? 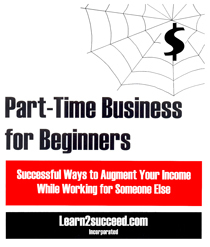 Part-Time Business for Beginners: Successful Ways to Augment Your Income While Working for Someone Else by: Learn2succeed.com Incorporated: softcover; 152 pages; ISBN: 978-1-55270-354-0; published in 2009; $24.95.